I love the look of a tweed jacket like this one that is only $60. It is both classic and trendy. A jacket paired with jeans is the perfect look for so many occasions - and something I wear a lot. If you are thinking about getting some "slide pumps" - I recommend these, in either red or white. And, the gold tip on the heel is a fun accent. Also, I found a really similar white tote for under $100. If you are looking for gift ideas, this "mom" necklace would make the perfect Mother's Day gift. These linen joggers are very popular and look great styled with pumps. This silky satin blouse is a great deal! I love a striped shirt like this one paired with black jeans and white pumps. This sleeveless blouse comes in perfect colors - like this apricot color. I love a classic henley shirt like this one that is 25% off. They brought back this popular sweatshirt. A cute two-in-one sweatshirt/lace blouse. These suede mules that come in 8 colors are 25% off. This is a fun ruffle dress is a stunning red (also comes in black and an emerald green)! These new arrival coral sneakers - perfect spring workout update! I splurged on this hair dryer (my last one stopped working) and I love it! I am thinking about buying these to help when I dry my hair - anyone else use them or have recommendations? I bought these cute “work” pants. Heads-up - they run smaller than expected. Also, today we continue our "Ask TBB" series over on The Blended Blog. You ask - we answer. Do you have a questions about home decorating, spring styles, or how to start a blog? Ask away. Stop by and see what questions we are answering HERE. I am one of the contributors this week answering your questions - all about what spring shoes to buy and what our families think about us blogging. Be sure to stop by and see what I had to say. This is one of my favorite spring looks. That look is so cute! I love the tweed jacket. That mom necklace would make a terrific gift! I love anything tweed! It's makes such a statement and is always a classic wardrobe piece. I love the look of tweed jackets! So classy. This particular one is just beautiful with the different color from standard black or blue. 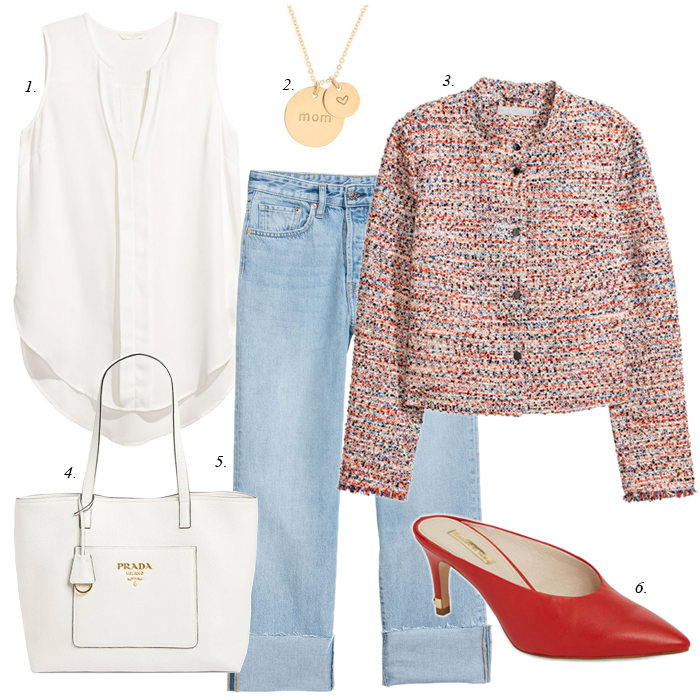 I like the dichotomy between the dressy tweed and the casual light wash of the jeans.